Back to 1982. Jim Wise pulled off an A+ sound quality AUD for us here. And the Dead did their part in delivering a top shelf performance as well. If you find yourself needing a really good AUD recording to help you fully appreciate the medium itself, and are also on the lookout for some shining musical moments tucked away in the early 80’s, this is the tape for you. On 09/17/82 we are treated to a well delivered first set. Particularly nice is the Candyman (always a personal fav). Jim’s recording is so fine, and Jerry’s heavily wha’d guitar solo just goes down so nicely. On Dupree’s you can hear Jerry straining on the highest notes – a precursor to the demise of his voice to come shortly thereafter. But for the most part, we are still hearing a strong Garcia. We also get the debut of Throwin’ Stones which is well played, if a little rough around the edges. It then segues into Deal with the precision of an FM D-Jay’s skilled hand very nicely. Deal closes the set with some good power. Set two opens up with the second Touch Of Grey ever, which is also very nice. Woman Smarter, which follows, is in its prime. Then there’s one of only three High Time’s from the entire year, all of them tucked into this September run. It’s light and airy, somehow more deeply psychedelic than you would think the song should be. The music sort of shimmers into view all the way through - Bobby’s guitar laced with wonderfully gooey affects. And from here we go directly into the meat of the show. Estimated Prophet is delivered with a great deal of energy and gusto. The song just seems to want to break its leash and run. Bobby howls out the vocals, and the drums pound. The song wastes little time in finding its pocket. After Bobby gets off sufficient rounds of “Heh HEH’s!” to confirm his ultimate cheesiness from this era, the band quickly slips into the kaleidoscope of interweaving rhythms and sound patterns that pervade great Estimateds. Jerry syncopates with the drummers, while Bob flashes chords in all the right corners. The music beams out into wide interlaced arcs and waves, fitting together like tiny gears inside of a pocket watch. We come out on the other end briefly slipping lightly into a night lit meadow of rolling grasses and flowers which endlessly open up before us until they fill our entire visual field, revealing a lilting Eyes Of The World within. Eyes has a delicious tempo. Waves of warmth flutter out of the music like birds doing ballet. They drag long feathered trails behind them that curl and turn like streaming flags in watercolor hues. 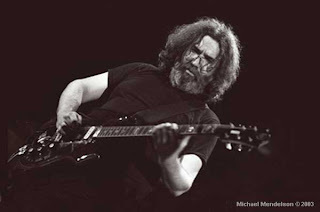 And when Jerry solos, everything exudes happiness and exuberance. He reaches for extra expression time and time again, his playing drawing on the joyful emotional backdrop of the music. The extra efforts are unforced, and it all lends to the magic. With the last solo, the band settles into a simmering ocean of music. Phrases are being echoed throughout, such that rippling patterns of sound vibrate into light and air. Wave patterns crisscross, and the band is listening to itself so well that each echo migrates between instruments causing any path your ear would follow to be swept into a converging path. Wonderful stuff. As ever, it’s hard not to be fully immersed in the timeless beauty of this song . Things slowly grow to a towering first solo section. Jerry’s tone is just piercing the air around you. The entire band supporting him like warriors. Then the last verse comes with a hush – Jerry’s gentle and mournful vocal inflections sounding completely heartfelt. The quiet solo section begins under the entire audience clapping in slow time to the beat. You can feel the entire room synched up together. Quickly the energy floods back over the music and Jerry is sending light beams over the stage. The solo ends somewhat sooner than you might like, but it’s still a lovely version. Enjoy this show for its wonderfully tight musical interplay throughout – something always very akin to good 1982 shows. The recording quality allows the doors of enjoyment to fully open wide for you. Good times. I was at this show, and have very fond memories of it, especially the amazing Morning Dew! Looking back, it seems like there were a disproportionately high number of great Maine shows; the Augusta fall '84 shows spring readily to mind, among others. Good times! and cant forget lewiston '80 and the killer oxford shows in '88... maine did rule for GD shows, so did new england in general.